Louisiana Floods Leave At Least 6 Dead, Tens Of Thousands Forced From Homes : The Two-Way More than 20,000 people have been rescued from the floodwaters. The state's governor describes the flooding as "unprecedented," and authorities are warning that waters could rise more in some areas. Flooding can be seen on O'Neal Lane, looking north from I-12 in Baton Rouge, La. Devastating floods in southern Louisiana have killed at least six people and pushed tens of thousands from their homes. As the Two-Way reported Sunday, Louisiana Gov. John Bel Edwards declared a state of emergency over the weekend, describing the flooding as "unprecedented and historic." More than 20,000 people have been evacuated from their homes, saved by teams in high-water vehicles, boats and helicopters. 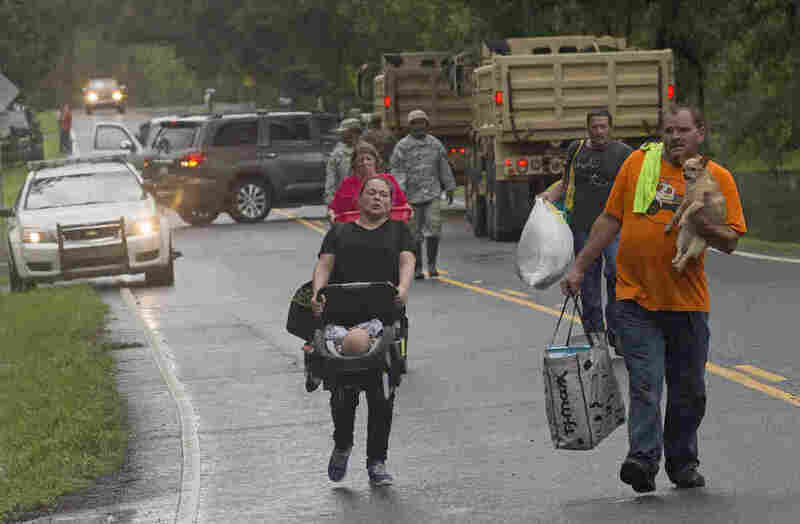 Some were rescued by local emergency workers, the National Guard or the Coast Guard; in other cases, says NPR's Debbie Elliott, ordinary citizens put their boats in the water to save their neighbors. Craig Cooper, national spokesman for the Red Cross, says more than 10,000 people are housed in shelters across the state, with "no clear expectation for when they'll be able to get back to their homes." At least five people have died, Eileen Fleming of member station WWNO tells our Newscast unit. The flooding was prompted by an intense deluge of rain that began on Friday. "Some areas recorded more than 25 inches of rain over a 72-hour period," Fleming reports. "Drivers tried to navigate treacherous roads where the water lapped at the side or covered the asphalt in a running stream. 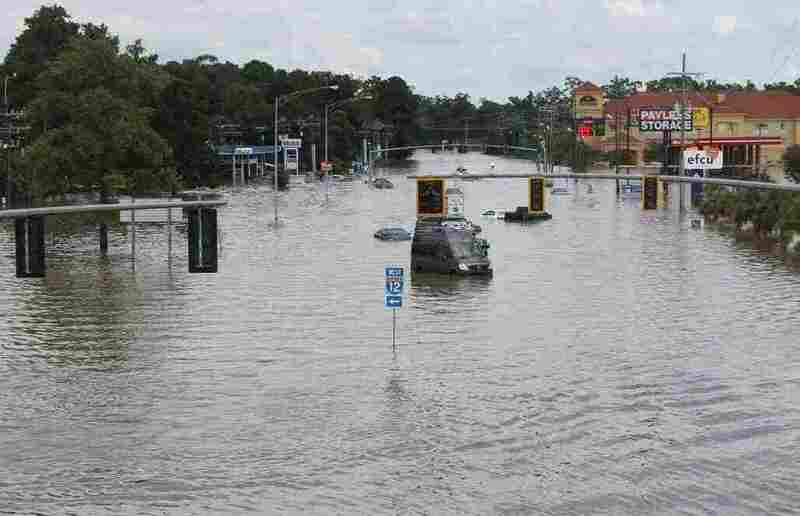 Abandoned cars were pushed to the side of the road, lawn furniture and children's toys floating through the waters." Debbie is in Baton Rouge now. "All throughout south Louisiana you have places where canals, creeks, lakes, rivers, you name it, are overtopping their banks," she reports. "It's widespread, from right around the Louisiana-Mississippi state line stretching over toward the Texas border." Some regions of Louisiana are used to seasonal high water, Debbie says, but this flooding is different. It's hitting areas no one expected to be submerged. "We think of the spring floods along the Mississippi River or floods maybe associated with hurricanes this time of year, but nothing like this," she says. She spoke to Brandon Voight, who owns an appliance store in Amite, La., with his grandfather. There was a foot and a half of water in the store, powerful enough to sweep a massive propane tank from the store, over a 6-foot fence and into the woods. People are evacuated by members of the Louisiana Army National Guard near Walker, La., on Sunday. "We realized it was coming up too fast, but still we never in a million years thought it would get in the store — or my grandma and grandpa's house back there on the hill," Voight told Debbie. "You had to look up to see that house," Debbie says — and the Voights reported it was filled with 10 inches of water. "Because these are record floods, we don't know how wide the water is going to get in those areas," he said. "This is unprecedented — so we don't have records that we can go back and see who all's going to be impacted." Edwards, too, has been evacuated, The Associated Press reports: The flooding has reached the governor's mansion.